The same night that a worldwide pandemic hits, a famous actor dies from a heart attack while performing King Lear on stage in Toronto. A young girl watches on in horror as a paparazzo turned paramedic student attempts to save his life. Weeks later, 99% of the world’s population is dead. Fast forward 20 years, and that little girl, Kirsten, is part of a traveling symphony and Shakespeare theatre troupe that walks through northeastern North America performing for any survivors in the small towns that have sprung up along the coast line. People have learned to survive, barely, and quite often an entire town can consist of a few families living in old gas stations or restaurants. The symphony lives by some pretty simple rules – they don’t get involved in town politics, they stay away from towns where prophets or fear mongering exists, they don’t pick up stray children. They live by a simple motto as well – Survival is Insufficient – a quote from an old episode of Star Trek Voyager (which pretty much no one remembers anymore). In fact, there are not many people left who remember what life was like before the Georgian Flu; those, like Kirsten, who were children before remember little of their childhood. Life was too unstable in the first few years; all of a sudden there was no electricity, no internet, eventually gas went stale so there was no more real travel. People kept dying, but now it was from other people or the elements. Life was harsh and scary and it was easy to forget that it hadn’t always been like this. Kirsten does try to remember some things from before – she has become a little bit obsessed with Arthur Leander, the actor who died in front of her all those years ago. She and another in the symphony scavenge houses and buildings whenever they can and Kirsten looks for anything she can find about Leander; newspaper articles, magazines, books, whatever. 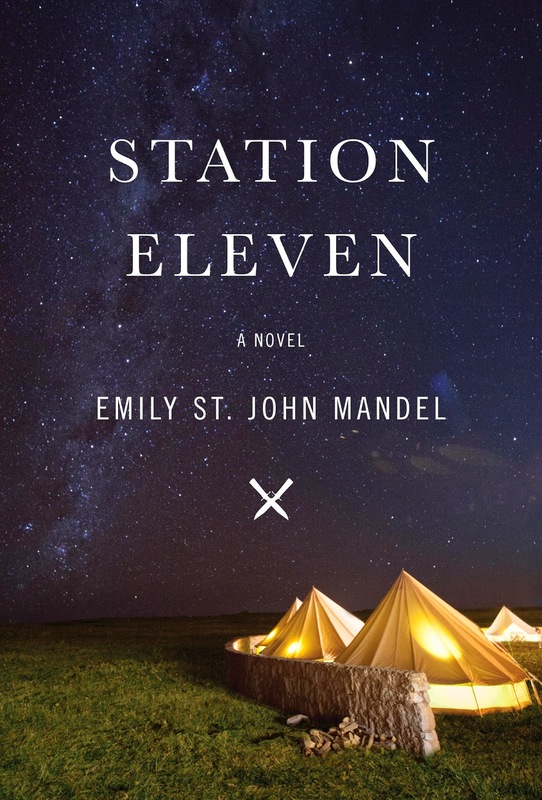 She is also obsessed with finding more volumes of few comic books that Leander gave her while they were performing together – Dr. Eleven V1 No 1: Station Eleven and V1 No 2: The Pursuit. Kirsten is obsessed with the books and is constantly searching for more of the story. Throughout all of this we learn more about Leander’s life – his fame, his three wives and his young son, all told from different perspectives, at different points in Leander’s life. We are also re-introduced to Jeevan, the would-be paramedic in his former life as a paparazzo. We’ve already seen how their lives have connected once, Kirsten, Leander and Jeevan, but I believe that there must be a further connection down the line. There have already been hints of this, and I am pretty sure of at least one of the connections and I really can’t wait to see how it plays out. I am a sucker for connecting storylines. The story seems to be focusing on one town in particular where a couple from the symphony stayed to have a baby a few years back – but when the symphony shows up again to collect them, the couple and their child are nowhere to be found and the town is under the sway of a ‘prophet’ who declares that the survivors are of the light, and that those who do not wish to follow him can leave. Once again the midpoint has cut me off right when the drama is starting and I am quite looking forward to getting back to it. I read another review of this book where the reviewer was annoyed with the appearance of the prophet, saying that prophets are overdone in the speculative/post-apocalyptic genre, but I totally disagree. Sure, there tend to be a lot of prophets, but I think that happens in books because that’s what would happen in real life. Already, when there has been no apocalypse and the world is overrun with people, we have prophets and holy men and people who try to tell us that they are going to save us, so long as we follow their will. It makes perfect sense that in a world where there is no more security or protection these people will take advantage to rise higher than ever and gain the power they never could before. For me, something magical happens when literary fiction and genre fiction are blended. I love both of them for their own merits. I love the way that most literary fiction tends to be character driven, getting inside the heads of people, seeing a situation from all different points of view, being lied to and manipulated by an unreliable narrator or seeing a characters motivation for their actions. I love how most genre fiction is plot driven, where you never know what is going to happen next, you get to learn about fantastical machines or races of aliens or space, or be dead center in the middle of a gruesome murder scene. But when a book contains elements of both… that is definitely my perfect cup of tea. And that is exactly what Mandel has done with Station Eleven. I tell you, this book would appeal to pretty much everyone I know – from die hard genre fans to die hard literary fiction fans. The writing itself is beautiful. I must say, my early comparison to Atwood was dead on. Mandel has created a completely believable (and relevant given the recent Ebola outbreak) world ravaged by the death toll and slowly being put back together by the surviving humanity. However, this book is a quiet book, a quiet story. There is drama and action but it happens soundlessly and unobtrusively. That’s not quite right, but I can’t find the words that I want to express the feeling of this story. I think Mandel has set up such a perfect background for the story to play out in. I am not great at picturing things, but the imagery that she sets up makes me think of a wide open prairie, a huge vast expanse of land, flat for miles and miles, and even though the situation may be loud and wrong and scary, the land is so vast that no one can hear a sound. Does that make any sense? I’m not sure it does considering what I know of the east coast geography. But that’s what I picture anyway. All I know for sure is that this a beautiful story and I cannot wait to get back to it. I really hope that what I think will happen happens, and I cannot wait to see how it plays out. I really think that the appropriate tea for this book is whatever tea you can get your hands on! At the end of the world there is no way that we are going to be able to be selective - so you make sure and hoard whatever tea you can find, cause you are going to have to make it last for a lot longer than expected... you know... when the world ends.